Whole squid is becoming quite popular with home cooks because they contain a gourmet prize: squid ink. Squid ink has become the secret ingredient for famous chefs around the world to not only color pastas and risottos, but also lend a touch of flavor. Squid ink is available in some gourmet markets at a hefty price, but if you buy whole squid, you can harvest your own squid ink. All it takes is a bit of careful cleaning. Cleaning your own will also save you money. 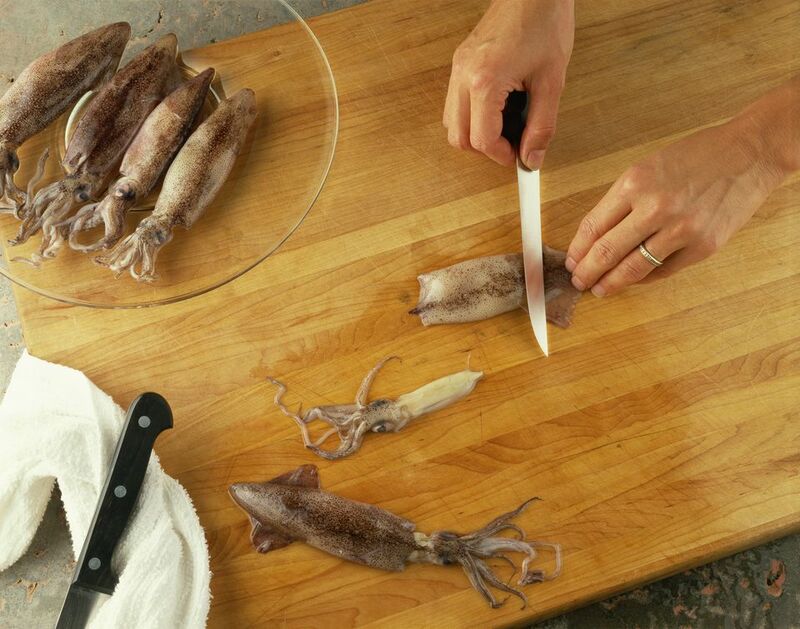 To clean squid (see the photos step-by-step), grip the head in one hand and the body in the other. Gently pull the head away from the body. The entrails should come right along with it. The ink sac will be in the innards. It is thin and silvery, about one inch long and 1/16th in width. You won't get much ink per squid, but a little goes a very long way. If you wish to reserve the ink, puncture the ink sac and squeeze the contents into a small bowl with about 1/4 cup of water or vinegar. Very small deposits of ink can also be found just behind the eyes. The tentacles are perfectly edible. Sever them from the head just below the eyes. Remove and discard the beak from the center of the tentacles. Inside the body, you will feel a long, thin sliver of cuttlebone which must be removed and discarded. The outer colored skin can be scraped or rubbed from the body tube under running water, leaving the white meat. On smaller, more tender squid, it is not necessary to remove the outer skin, but on larger squid, the skin tends to toughen with cooking. Rinse meat and tentacles inside and out under cold running water. What is the Correct Method to Prepare Soft Shell Crabs?